Tortillas are best known as those handy (and tasty) contraptions in which we put the delicious ingredients to the most beloved Mexican foods. These edible containers are possibly the single most important aspect of Mexican cuisine. The taco, burrito, and chimichanga would be reduced to a messy pile of ground beef salad without them. Tortillas aren’t quite stable enough to put soup in so someone had the great idea to put the tortillas in soup. Hence, the blessing we know as tortilla soup. Tortilla soup is normally based on chicken or beef stock but seafood variations are equally delightful. 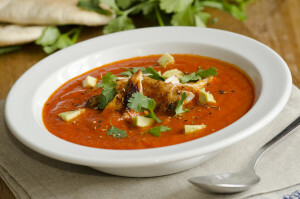 This well-reviewed recipe from myrecipes.com combines delicious tortilla soup with shrimp and avocado. The avocado balances the spiciness nicely without limiting the flavor. It should only take about 20 minute’s total time— preparation and cook time. Heat a Dutch oven over medium-high heat. Add oil to pan; swirl to coat. Add onion and next 6 ingredients (celery, carrots, chipotle chile, ground cumin, chili powder, garlic). Cook 6 minutes or until carrot is crisp-tender, stirring occasionally. Add broth, hominy, and tomatoes; bring to a boil. Cover and cook 6 minutes, stirring occasionally. Add shrimp; cook 2 minutes or until shrimp are done. Remove from heat; stir in juice and salt. Divide shrimp mixture evenly among 4 bowls; top evenly with chips and avocado. Garnish with cilantro, if desired. Impress your guests with your excellent creation. This recipe comes together quickly, especially if you use pre-chopped ingredients. If you want to add some more substance to the soup you could try adding large jumbo shrimp or use a pound instead of 12 ounces. The hominy adds a type of pasta texture without the extra calories. If you’re not a fan of hominy, try substituting canned or roasted corn in its place. The soup is already spicy enough for most people, but if you want to take it up another level, add 1/8 diced jalapeños. If you want to limit the spiciness, add less chili powder. Another idea is to add some cilantro for more of the “Latin” taste family, typical of Central America. This recipe is quick, tasty, and great for leftovers if you don’t have time to make a fresh meal every night! If you want a fresh authentic Mexican meal and don’t feel like cooking, you can enjoy our own Tortilla Soup along with a margarita at Acapulcos Mexican Family Restaurant and Cantina. We have many locations throughout Massachusetts and Connecticut, and serve the best Mexican dishes and margaritas around! Check out our menus online and find an Acapulcos Restaurant near you.